Last Wednesday I had the pleasure of representing Moroccanoil at Pure PR’s press day. The event was an opportunity for Pure to showcase the brands and products they represent to press, influencers and bloggers. With a ‘back to school’ theme the team had turned an empty art gallery in Eastcastle Street, London, in to The Pure Academy. A restaurant/show room of dreams, filled with an array of hair, beauty and wellbeing brands. Back to school because the brands Pure PR represent are all top in their field. Moroccanoil will soon be launching a revolutionary colour care line in the UK. A 360 degree approach to caring for coloured hair. It was my job to introduce people to the line - I can’t wait to share more information about it with you guys soon! It was also an opportunity to reveal our Christmas gift boxes, whilst of course offering dry styling. Beach waves and braids seemed to be the order of the day, so I kept my Moroccanoil Original Treatment and Dry Texture Spray close to hand. I was surrounded by hair, beauty and wellbeing product lines. This is literally my idea of heaven! I spend my day working along side Sergio from E.L.F. A vegan make up a range and let me tell you why I was so excited about this! As a green eyed human being the best colour to compliment my eyes is purple. Now I’m (very) allergic to a product called Carmine. A red colouring derived from crushed beetles to create vibrant purple and copper tones in make up. I saw E.L.F’s bright purple eye shadow staring at me from across the room, and being a vegan range I knew this meant no carmine therefore it wouldn’t make me swell up like a balloon! Hallelujah! Aromatherapy Associates are a brand I have used previously. But if I’m honest I didn’t know a great deal about them. After chatting to Christina, their global director of education, I have learnt about the wellbeing benefits linked to aromatherapy oils. Did you know essential oils can be used to aid stress and sleep? They can be used to boost your energy levels and relax the mind. I definitely think I need to spend more time focusing on relaxing my mind. Something as little as introducing the appropriate blend of essential oil in your daily routine could reduce fatigue and make you feel more relaxed and ready for your day. I left with the deep relax roller ball, a fragrance formulated to bring out peace and relaxation. Imagine a working day socialising with like minded people whilst sharing knowledge on products you love. The team from Pure are a dream to be around. Passionate about the brands they work with and all round cool girls. Like the new kid in class I was made to feel welcome and can’t wait to see them at London Fashion week soon. There is nothing more aesthetically pleasing than a beautifully themed Instagram layout, created by uploading photos with the same filter so every photo matches. Back in the day (before smart phones and apps) black and white and sepia were our only options. But now we have hundreds of filters and editing tools at our disposable on various apps. I edit my photos, and I’m sure every flat lay on my blog has a warm hazy filter over the top to make it more pleasing to my eye - vsco T1 to be precise. I never filter photos when showcasing colour work as it wouldn’t show the true result. I love using photos as a tool when talking about colour, however it amazes me how many photos I see that aren’t real. You’d never know because the filter/editing looks real enough, but when you’ve seen the exact same photo in a different colour that is the give away. The ash blonde trend took photo fakery to a whole new level. There’s a beautiful photo of Cara Delevingne sporting an ash grey hue. The image isn’t real, the grey never happened. In a ‘Cara Delevigne Hair’ search on Pinterest you’ll see the original photo and the same with various filters on. I shout FUGAZI at my iPhone way too much. (Wolf of Wall Street fans, you know.) Generally shaking my head at the same time. Here is an example of an image I altered earlier. These edits took me about 10 minutes to make. Granted - if you look closely this isn’t the best editing. (Finger drawing on an iPhone screen) However I did it on a free app to prove how easily it can be done. I have posted the real photo below for those interested. There is absolutely nothing wrong with faking it in some cases. But what I don’t agree with is trying to pass a fake photo for real work. If I was to upload a photos to Instagram with the caption, ‘From copper to pink in one sitting!’ I’d be misleading my audience to believe this was achievable and it could encourage them to try the same. Not only will they be hugely disappointed when it doesn’t work, they might also think their hairdressing isn’t capable because someone else managed it. As I previously said I love to play with filters, however not on my work page. I use a ring light and an iPhone to take my photos and recently I’ve been making the background whiter to make my layout more appealing. If I was to filter the hair I’d only be making my life harder long term when someone requests the same non-existent filtered image.(FUGAZI!) Relevant to every social media aspect, don’t believe everything you see to be correct representation of reality, and hairdressers, stop filtering. I have been following Emma on Instagram for a couple of years now. It was the textured up-do's and flawless make up that got me hooked! On many occasions I have tried to recreate Emma's hair and make up look on myself and clients. With daily tips in her stories I have picked up so many new tricks. Emma has 142k followers, replies to all social media enquiries and with a fully booked schedule I'm sooooo grateful to Emma for fitting in the time for this interview. I'd highly recommend a read for any one wanting to get started in the hair/beauty industry. Emma took a risk going it alone and it has certainly paid off! Emma, you are undoubtedly one of the best hair and make up artists in Australia right now, but what came first, hair or make up? Not over styling the hair, the key is to use your clients natural texture and add to it not try to change it. If you had to pick one product for your make up kit to give the glow we see so often in your photos, what would it be and why? Becca Opal Liquid , as you can apply it on the highs of the face under foundation , you can mix it in with your foundation also to give a more luminous finish and its also great for the chest area . You have always replied to my social media messages, that I am very grateful for! How long do you spend on social media a day? Omg it can be a struggle working full time and trying to keep up to date with all the social channels, emails etc. But I would say on average I spend 1-2 hours on insta throughout the day, trying to reply to messages, comments and of course uploading content. Morocco, I’m obsessed with all the imagery I see on insta and don’t even get me start on the rugs and homeware they make and sell! Run us through a day in the life of Emma Chen? This is a hard one as every day is sooo different. Usually I will re pack my kit from the day before and do a cross check to make sure I have everything for the job that day. I tend to do a lot of driving to Byron so I always make sure I download a good playlist for the drive. Once my shoot has wrapped up I always come home and shampoo all of my brushes and sponges. A lot of artists only use brush cleaner on their brushes to sanitise however I love how soft they feel once they're washed and I find the shape holds better. I will then try to get to my emails while my husband cooks dinner (I'm lucky I know!) and then recently we have been addicted to the TV show Married At First Sight, so we will watch that! When thinking about your career so far, what has been the most defining moment and why? For me it would be at the start of my career & remembering all the fear I had in taking a leap of faith and going out on my own, free lance. I never thought I was good enough to make it. It was a defining moment the day I quit working for others, truly backed myself and took that massive risk. I was 29 at the time, so financially I was scared as I had so many responsibilities, but it paid off! I worked so hard and took every single opportunity there was. No way I was going to let myself fail. Lastly where do you see yourself in 10 years time? I would love to travel a bit more with work and take on some different types of jobs to push myself out of my comfort zone. Emma is a true example of hard work paying off. Incredible talent teamed with a good work ethos - a match made in heaven! The above photos are all Emma's work. For all things hair, make up give Emma a follow. Emma fills my feed with beautifully bronzed faces and I bookmark pretty much every hair up. Emma's stories are also quite funny, and you know - that always helps! I spend most of my holiday in bright flowing dresses. The kind of dresses I feel I just can’t get away with back home. I’ve built up quite a collection over the years and when teamed with delicate gold jewellery and simple sandals, I feel good but stay cool whilst exploring. This year we stayed at a small villa in the Tuscan hills. A small village called Fiasole, five minutes away from Florence. Close enough to venture in to the Tuscan capital, but far enough away to relax in the tranquil surroundings. After lazy breakfasts and mornings spent by the pool, we spent our afternoons exploring. I have never been disappointed with Italy. I love the history, architecture and of course the food. My boyfriend planned this trip and he found some incredible places to eat and the best spots for afternoon cocktails. My 1 year old stayed at home with Grandparents, so I could spend a little extra time getting ready in the evenings before dinner. I like to use my everyday products whilst away, because I know they work for me. Hotel product packaging can look nice, but it just isn’t the same! Long weekends away call for hand luggage only, meaning I plan ahead when it comes to packing. I plan my outfits (down to accessories) in advance and prepare my 100ml travel sized hair and beauty products in a clear wash bag. This year packing was made easy by Moroccanoil. Their mini travel sizes are 100ml or under and don’t take up too much room in my cabin sized case. I opted for the ‘destination repair’ kit. Including a Moisture Repair Shampoo and Conditioner. A Moroccanoil Treatment Oil Original, and the styling product I can’t live with out - Dry Texture Spray. All containing nourishing, antioxidant rich argan oil, this is the perfect combination for hydrated, healthy locks. In regards to skin care, it had to be Eufora Beautifying Serum. For hair, skin and scalp, I may as well bathe in it! I apply it to my face twice a day and this is a MUST for holidays due to the soothing cranberry extract. Mosquitos, do what you’ve got to do, because Beautifying Serum will take away the redness and itchiness in a flash. I keep a travel size in my handbag, and have been known to whip it out when my friends have had skin complaints in the past. Spot? Beautifying Serum. Bite? Beautifying Serum. You get the gist! Travelling light made this trip easier from the get to. We used local buses and walked around Florence with our cases. This wouldn’t have been fun with a 20kg case in 35 degree heat! Travelling light is something I’m become quite good at. So until next time, my travel sized bottles will be saved in my little clear lightweight bag, ready to top up! Monday 18th February, 2008. It seems like yesterday I started my apprenticeship at Pure Hair. I was 16 at the time and living with my Mum. I had just met my boyfriend and didn’t really have a care in the world. Fast forward 10 years, I’ve been a stylist for over 7 years and I’m a self employed educator for Moroccanoil. I now live in my own home (with the same boyfriend!) and I’m a Mum to the most beautiful, full of life, 1 year old. It makes my head hurt if I think about it too much! Where on earth did those 10 years go? And how have so many significant life changing events happened?! I wouldn’t say I started work with a plan of how I wanted my future to look. I have been given great opportunities, not only from Pure Hair, but from all our product lines. And let me tell you, hairdressing education is like nothing you’ve ever seen before! I’ve attended a Paul Mitchell education in Rome. (John Paul Dejoria, the co-founder of Paul Mitchell, also owns Patrón Tequila - that was a good weekend!) I’ve been fortunate enough to visit the factory in Tuscany where our colour line, Sens.ús is formulated and made. Not only was the Eufora education in San Diego one of the best events I’ve been to, San Diego at Halloween is on another level! At the same time I started my career in hairdressing 10 years ago, Moroccanoil was born. Their first product, Moroccanoil Treatment Oil, was the product that pioneered the world of oil infused hair, and created the worldwide buzz on argan oil. Not only did it treat the hair, it was - and still is - a styling and finishing product. When Moroccanoil held an event, this huge buzz meant everyone flocked to see what was going on. Nobody wanted to miss out on free samples or Moroccanoil merchandise! Because of the demand, Moroccanoil reached out to their stockists asking if anyone could help at their events. I was totally up for 2 days of fun in London. I loved Moroccanoil and jumped at the chance to spend time with the team and help out. Moving stock, handing out samples and assisting stylists were just a few of the things I did at my first event. I met some incredible people and couldn’t wait to help out on future events with the team. Since then, I have worked on PR events starting at 4am at the coolest locations. In 2012 I worked at V festival styling hair by day and watching Ed Sheeran by night. I’ve styled hair for Paul Smith, Alice Temperley, Aadnevik and Osman at London fashion Week. I thrive off a busy schedule and with no two days the same, I absolutely love it. Not only do I still attend these incredible events, I’m now a Moroccanoil Educator for the U.K. I love meeting new people, teaching them tips and tricks I have picked up along the way, whilst also learning new things from them. Hairdressing is a rapidly changing industry and much like beauty, hair and fashion are in the eye of the beholder. So there is always room to up your skills and knowledge. My first Moroccanoil education was in Ireland, three years ago. The venue was a beautiful converted church in the centre of Dublin. Considering my Nan (who I lived with for 10 years) was Irish, this was the first time I’d been over to visit. Finding out the venue was right next to the school my Nan used to work at, was a sign I was in the right place at the right time. I’m a firm believer in you get what you give. When I’m asked to do something I will give it 100%. I also take every opportunity given to me, because you never know where the opportunities may lead. It’s the second week of Summer and crazy things are happening. My hairdryer has been unplugged, as I’m letting the warm air take care of drying my hair. My foundation is at the bottom of my make up bag, because my freckles are out in full force. I’ve even got a bottle of rosè chilling for the weekend. (Girl gone crazy.) I am. Totally. Feeling. Summer! Summer is the most relaxed season, don’t you think? Clothes are brighter, my hair is lighter. And I will most definitely colour my hair rose gold to match said chilling rosè, because why not?! Another huge part of Summer is the festival scene, and us Brits don’t do too badly when it comes to festivals. We may not have Coachella, but with Lovebox and Latitude next week, Wireless, V Festival and Reading in August, we do have a great Summer line up. Festivals are all about enjoying good music with good people - rain or shine - and if it’s not the perfect time to experiment with fashion, hair and make up, when is?! I'm talking glitter on top of tassels on top of diamonds, with bright make up thrown in for good measure. Primark have introduced a new range for Summer - Glitter Junkie. With their beauty department rapidly growing, highly pigmented glitters and beautifully designed body gems are just a few of the things I picked up when I discovered Primark’s new Glitter Junkie range. 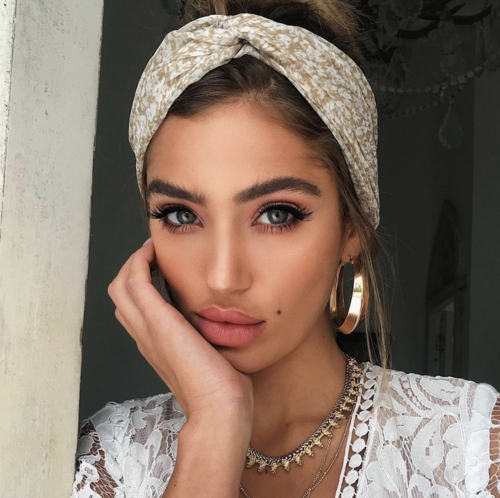 Perfect for festivals, and Summer parties alike, I’d like to show you a few of the looks I have created using these festival accessories and Moroccanoil. At just £1.50 for a test tube full of the most amazing Glitter Junkie sparkle - I took one in every colour! I prepped Helena’s Hair with Moroccanoil Treatment Original and Moroccanoil Mending Infusion to create a smooth, shiny canvas ready to Dutch braid. Braids are the best way to keep hair in a secure style that won’t budge for days. Great for a 3 day festival. Once braided, I applied Moroccanoil Extra Firm Hairspray all over, holding the can 30cm away from the hair, followed by an additional spritz up and down the parting holding the can much closer. The hairspray looked slightly wet on the parting section, perfect for the glitter to adhere to. I then sprinkled the glitter down the middle and used the cold setting on my hairdryer to set the sparkle in place. I picked up the glitter in white, pink, silver and blue. Complete with water soluble body glue, this is a great accessory for body and hair art. Body gems over the last few years have got bigger and better. The trend started with small clusters of gems for the face. But now you can get body gems for practically anywhere on the body. The gems I used to create Helena’s festival look came in a pack of two (£3.00) and are actually designed to sit on the back of your thighs, just under your shorts. When I saw them, I felt it was something different and went perfectly with our pink theme. To create Helena’s lived in beach waves, I used a medium tong, leaving the ends completely straight. Not forgetting Moroccanoil Perfect Defense to protect from the heat. After shaking the waves out. I finished the look with a healthy dose of Moroccanoil Dry Texture Spray. Great for effortless, undone waves that need to last through the weekend. These cute midi rings are just that - rings designed to wear on your fingers. But once again I wanted to experiment, and for a pack of 10, £1.50 was a very affordable option to create my last festival inspired look. With Helena’s waves already prepped from our last look, I added more Moroccanoil Dry Texture Spray before braiding to give added grit. This makes the hair much easier to work with when using small sections. Using the rings is as easy as twirling the hair around with your finger to make it smaller, and sliding the ring down the hair. I then added the next section of hair, (much like you would with a French plait) and repeated with the next ring. I tied the ring mohawk and braids together with a clear band and finished with a relaxed topknot. My festival accessories cost £6, an absolute steal considering I can reuse them all. I would highly recommended a visit to your local Primark to stock up on all festival essentials! I will be keeping my glitter in my salon kit, so if you fancy a bit of sparkle after your blowdry - let’s go crazy! I have been working with Olaplex for over 2 years and I fell in love with their revolutionary product instantly. Olaplex has completely changed my thought process when colouring hair. Olaplex allows me to go ahead with colour changes that once weren’t possible, without causing damage. Brought to us by Dean Christal and designed by 2 scientists, Dr Eric Pressly PHD in Material and Dr Craig Hawker PHD in Chemistry. Olaplex is the product that has changed hairdressing. Olaplex is a single active ingredient. (Bis-Aminopropyl Diglycol Dimaleate - very scientific!) Designed to reconnect bonds that have been broken by the process of colour, heat and mechanical damage. Olaplex repairs the internal structure of the hair, and can be used when colouring to prevent damage whilst repairing. It can also be used as a stand alone treatment to repair the hair in salon, or at home. The internal structure of hair is made of disulfide bonds. These bonds are linked together from roots to ends. I think of these bonds like a shoe lace threaded through the eyelets. When tied together your shoe is secure, strong and can take the movement as your walk. When left loose the eyelets become weakened, therefore you’d be more prone to tripping and causing damage along the way. Olaplex re-links any broken bonds in the hair, to make the internal structure strong again. As previously mentioned Olaplex can be mixed with colour to prevent damage and repair. As a hairdresser who looks after lots of beautiful blondes and regularly carries out big colour changes, Olaplex is a great tool I always keep close to hand. Not to be confused with a magic wand, Olaplex will only work if there are still bonds present in the hair. In very extreme cases hair can be so damaged, there aren’t bonds present. Stand alone Olaplex treatments and regular cuts would be recommended to get the hair back at its best before even thinking about colour if this was the case. Below I have coloured 2 pieces of hair to show a comparison. The hair is real hair and had previously been bleached. Formula 1 /Right photo - Deco (a form of lightener/bleach) and 30 volume. Formula 2/Left photo - Deco (a form of lightener/bleach), 30 volume and Olaplex. A picture is worth a thousand words, and you can clearly see the difference in the condition of the hair. After washing both pieces of hair, I roughly dried them without using any product. I could tell the hair coloured without Olaplex looked finer at the time of drying, but it wasn’t until I came back to them a few days later I could really see the difference. The over bleached piece of hair had swollen, looked angry, broken and frazzled. Whilst the piece of hair coloured with olaplex still maintained its original shine and strong structure. The product I used to bleach the above hair was a strong formulation. It wouldn’t be a formula I would use on hair that has already been lightened, it’s clear to see the damage that has been caused. If you are thinking about a drastic change or you feel your hair is not at its best condition wise, speak to a professional before your colour appointment and ask for a strand test so you can see what would happen on a smaller strand, before going ahead with the complete change. Search for a salon who uses Olaplex. Patented technology that works. It’s important to look after your hair from the inside out. If the structure is strong, goodness will follow. I’ve had clients comment on how their curls have come back to life and been less frizzy. I’ve had clients tell me their hair has never been so long. I personally used to dread having my hair cut, as it never seemed to grow. (It obviously grew, it just didn’t stay attached at the ends!) Now I’m having a solid inch cut off every time. Looking after your hair internally, backed up with a selection of suitable products to cleanse, condition, treat and style your hair with at home, will 100% give you the best from your hair. What’s more exciting than a visit to the salon for a full colour? Well let me tell you - said colour looking just as good, without a root in sight 8 weeks later! I give you babylights. The traditional highlight’s baby sister. Smaller, finer and delicate in appearance. Used to create a soft blended look whilst keeping hair colour looking better than natural. By leaving space between the foils and following the natural curvature of the head, babylights are also a perfect option to contour the face with lighter pieces, (Natural colour will always be lighter on the ends and around the hairline.) Also a great alternative when you want to change up a balayage. I don’t go a day in the salon without using this technique. Here are some examples of my recent work. Please follow me on Loren's last appointment to see if babylights are something that could work for you. I have coloured Loren’s hair for 8 years, and babylights have been our choice of technique for the last 2. We keep the colour current by changing tone, and occasionally adding a darker root, because as we all know, change is good. A subtle change can lift your mood and actually make you feel pretty special! After all, your hair is one of the first things you see when you look in the mirror. Loren leaves her colour in my hands, and with a pending holiday just over a week away, it was time to take that golden blonde tone whiter and excentuate Loren’s natural lighter hairline. If I’m totally honest Loren’s hair looked great when she came in. I found myself questioning how long it had been since we last coloured. It had been 10 weeks. Loren wanted a colour purely for a change, not because her roots were bothering her. I used one colour to babylight, knowing Loren’s natural colour would act as a second. Followed by a toner, Sensus inBlonde to be precise. The inBlonde range tones the hair beautifully and evenly at a slow and steady pace. Meaning the longevity of the tone will last a lot longer than your average toner. As you can see in the photos, we have lifted the hair blonder and opted for an ash tone . You may notice the root area still looks darker than the ends. This is the beauty of a babylight. Loren won’t notice her roots as her hair grows out, but we have still achieved a beautiful bright blonde. Complimented with a long textured bob, perfecto! Babylights aren’t a trend - they’re a modern way of colouring, used to keep colour looking stripe free and natural. Low maintenance, current and lived in, babylights are 100% for you if you don’t want roots dictating when you need a colour appointment.